Today, you’re going to learn 25 common euphemism phrases in English. 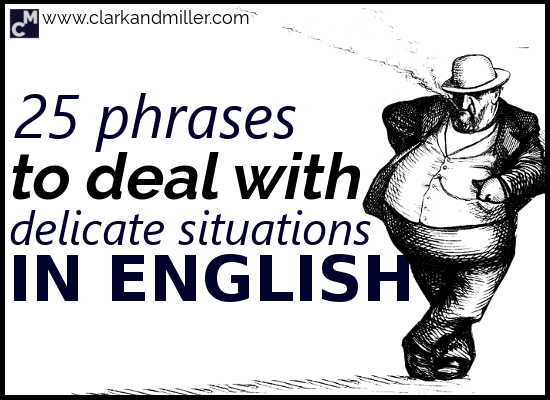 While you’re here, check out 28 Phrases to Feel Comfortable in English Conversations. Euphemisms are words (or phrases) we can use to talk about negative stuff without sounding too negative. We use them because we don’t want to use a particular negative word or phrase. They make people feel better, and that means we offend people less. So let’s look at 25 common English euphemisms. You know this situation. You’re talking about someone you know. And you basically want to talk about how stupid they are. Or how fat. Or how short. But you don’t want to be rude, right? He’s big boned. — He’s fat. She’s horizontally challenged. * — She’s fat, too. He’s vertically challenged. * — He’s short. She’s between jobs. — She’s unemployed. She’s getting on. — She’s old. He’s not the sharpest pencil in the box. — He’s kind of stupid. Not his fault — he just is. He doesn’t suffer fools gladly. — He’s rude and can be pretty unkind. She’s on the streets. — She’s homeless. *These phrases are a little light and funny. These are phrases that you wouldn’t like to say, and that you’d hate to hear even more. We’re going to have to let you go. War — a big topic for an English language blog, right? It’s a horrible and traumatic thing, and very difficult to talk about. It’s also a deeply political thing, too. I think those are the two main reasons we have so many euphemisms for war. People don’t like talking about the difficult reality, but also governments prefer to use “softer” words to make their decisions sound less violent. Collateral damage – When an attack kills innocent people (or damages homes, hospitals, schools, etc.). Extraordinary rendition – This is when an army takes someone away without going through any legal system. Friendly fire – This is when an army kills people on its own side, usually by accident. It’s always a difficult subject to talk about, so it’s no surprise that we have some euphemisms to talk about death. It’s good to have lots of different ways of saying “bad,” right? For example, there are some adjectives that make “bad” even more direct, like “awful,” “terrible,” “horrible,” etc. But what if you want to make it more polite and less direct? It wasn’t up to scratch. — It wasn’t good enough. It left a lot to be desired. — It was pretty bad and unsatisfying. That was a questionable idea. — There are problems with this idea. How was the trip? It was … Meh — How was the trip? It wasn’t that good at all. Not terrible but not good. OK. You can now use these euphemisms to sound less direct, and more polite and diplomatic. You can also understand more of what on earth they’re talking about on the news. So here are three sentences — can you make them less direct and more polite? Write your answers in the comments! Did you enjoy this post? Do you know anyone else who’ll find it useful? Please BE AWESOME AND SHARE IT, and let’s spread the knowledge! ⟵Can You Understand These 8 Natural British English Questions? This is the bee’s knees. Love the wit. You can even murder one as long as it makes you stronger.